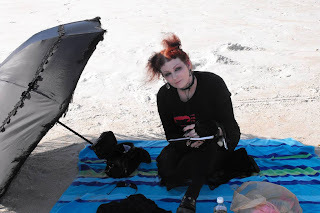 Alethea writes "This dedicated darkling was spotted under her gothasol on a 95 degree day. What is she writing? A short story worthy of Poe? A poem about the heartwrenching pain of summer vacations? A shopping reminder to buy more cloves? Note her one concession to the heat: a pair of gothy-industrial flip flops. And her one fatal flaw: an exposed line of scalp. That’s going to hurt next time she backcombs." Just noticed that she is left-handed, the hand of the Devil. She deserves a bonus goth point for that. Come see her, and us, at BanniNation.com. We have all types, not just goths.